I decided to get serious with my cookbook challenge and try one of the fancier recipes. After a hard day in front of the computer it was quite therapeutic doing all the slicing, stirring, and sieving required by this recipe. Don’t be misled by the photo — it was really delicious, and it’s only my photography skills that are at fault, not my cooking ability. The recipe is an interesting fusion of European and Asian ideas. The duck skin and meat are cooked separately, with the skin being diced and fried till crispy, and the breast itself poached in a rich red wine broth flavoured with oranges, onions, and balsamic vinegar. It’s then served on a bed of stir-fried leeks and carrots, with the reduced broth poured over and the diced crispy skin scattered on top. It was quite fiddly to do, but the sauce was fabulous, with a wonderful depth of flavour, and I liked the contrast with the crunchy veg. The duck was nice and moist because of the poaching and resting. I didn’t get my bits of skin quite crisp enough — next time I’ll fry them more slowly to render more of the fat, before raising the heat to crisp them. I think Chinese noodles would have been nice too, to soak up the sauce. Not a dish for every day, but great for a special occasion. Bonus — we now have a jar of rendered duck fat for frying potatoes. Mmmmm, I love duck or goose fat for roasting potatoes. And I really like the idea of fusion cuisine, introducing new ingredients or presenting familiar ones in a refreshingly new way. I’ve looked in here before, Veronica, but I can’t remember whether I’ve ever posted. If not, may I say it’s a beautiful blog. Please don’t put down your photography skills, they are certainly much better than mine (still non-existent at the moment). I hope my own blog looks as good as yours one day! I agree with Sunny – your photo skills are great! This duck recipe looks marvellous – what an inspired idea to remove the skin and cook it separately. Nigel (sorry!) has a great recipe for duck that I’m looking forward to where it is slow-cooked with Star Anise and ginger (p 346 of Kitchen Diaries) but no crispy skin in that one. Perhaps I’ll adapt it to your method? I decided to try making this last night. 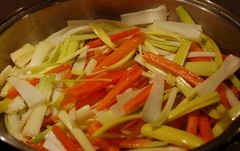 I loved the duck poached like that and the stir fried leek/carrot was interesting. We ended up deciding that the duck would be better with grilled eggplant, zucchini and capsicum. Also, that once the duck has been taken out of the wine/vinegar mix it would be good to add more sugar and boil it a little, so it’s more syrupy. Don’t thank me, thank Nicole 🙂 She is wonderfully inventive in her recipes. I highly recommend her book. 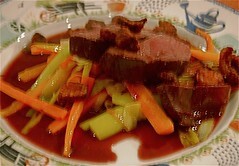 In the recipe, the sauce is reduced by half by boiling down, before being poured over the duck.